Washington, D.C., February 21, 2009 - The Justice Department this week missed the opportunity to bring transparency to the controversy over deleted White House e-mail from the Bush administration by allowing briefing to continue on a motion that had been developed by the Bush Administration. The motion, filed by the Justice Department on January 21, just after the inauguration, sought to dismiss the White House e-mail litigation even while admitting that a secretive restoration process was still not finished. Yesterday the Archive responded to that motion. The independent counsel investigating the Valerie Plame/Scooter Libby case first exposed the problem of missing White House e-mail in a court filing in January 2006, citing whole days of zero archived e-mail from Vice President Cheney’s office. Bush White House statements initially admitted that as many as 5 million e-mails were missing, then subsequently denied any problem. The most recent briefing makes clear that a far larger number of emails were effectively lost because they were mislabeled or misallocated and required extensive technical work to be found, while still additional emails were completely missing from the EOP server. The National Security Archive filed its lawsuit on September 5, 2007 against the Executive Office of the President (EOP) and the National Archives (NARA), seeking to preserve and restore missing White House e-mails. A virtually identical lawsuit filed subsequently by Citizens for Responsibility and Ethics in Washington (CREW) has been consolidated with the Archive's lawsuit. A chronology of the litigation is available here. Yesterday, February 20, was the deadline for formal response from the plaintiffs to the government’s January 21, 2009 motion to dismiss. 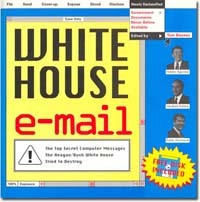 The January 21 government motion conceded that many days of e-mails written in 2003 through 2005 had been deleted from the Executive Office of the President (EOP) servers, that these deleted emails had to be restored from backup tapes, and that millions of emails had been mislabeled and miscategorized in the White House system, rendering them undetectable without a significant effort by the White House technology staff. The defendants, relying on the declaration of someone who has worked in the White House for only 4 months, claimed e-mails have been restored and the issue is now moot. The White House has provided no evidence that any of the problems that led to the loss, mislabeling, and misallocation of emails have been corrected.